Stress to the scalp and hair is caused by pollution in the air, exposure to UV light from the sun, and air conditioning or heater which blows dry air, taking away moisture from the air. Regular use of styling tools such as hair dryer and straightening irons or curling thongs, which has become part of daily styling routine is also affecting the health of the hair. 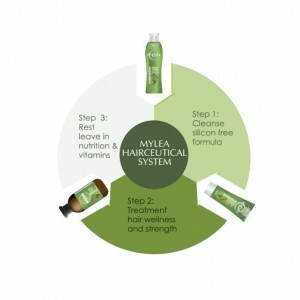 Mylea Hairceutical System series consists of three steps: Cleanse, Restore, rest. By following these three steps – the Mylea hair care regime, we not only ensure the health of the hair, but most importantly, the scalp, which provides nutrition and vitamints to strong roots.